Fraxel® Laser Treatment is a revolutionary and effective treatment for the following: wrinkles, uneven color and tone, texture irregularities from sun damage and aging, crepiness, and loose skin. The Fraxel laser is also proving to be the most effective technology yet developed for the treatment stretch marks. Fraxel® Laser Treatment is one of the major advances in non-invasive cosmetic technology in the past 10 years. It was developed by Rox Anderson, M.D. at Harvard. Dr. Anderson is the most famous laser researcher/physicist in the world, upon whose theories all laser technology is based. 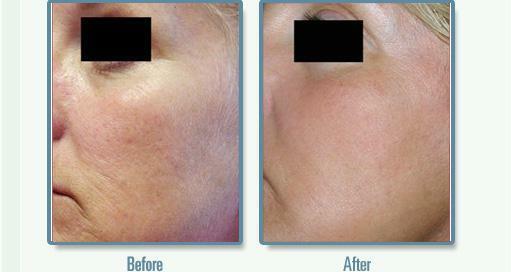 We have been performing Fraxel procedures since 2005 with over 1000 treatment sessions completed. Our experience, along with other laser experts, has now established the following analysis: Fraxel is the unequivocal laser treatment of choice for the following conditions � acne scars, surgical and traumatic scars, and stretch marks. It is not the most effective laser treatment for wrinkles, however (the CO2 and erbium lasers remain far superior for that purpose). The procedure, using our Zimmer cooler device and strong topical anesthetic cream, is virtually painless. There is no burning of skin, so there is no healing or down time. Patients return to work immediately or back to their daily routine as soon as possible, with merely a healthy glow similar to an hour in the sun. 3-5 treatments are recommended, but we evaluate every Fraxel candidate beforehand to discuss with them what Fraxel can and cannot accomplish for them. It is also recommended to avoid tanning and Retin-A and other retinoids for a week before the procedure. We have investigated the technologies below and are satisfied that they do not produce results as good as competitive systems which our offices uses. You are invited to schedule a free consultation to discuss any of these opportunities.